Blue Lock is a software which allows you to lock your Windows PC with the help of a mobile phone. It uses Bluetooth in the mobile phone and your computer to establish a connection. You can configure the software to add a particular Bluetooth device. For instance: a mobile phone or iPod. When the Bluetooth device is within the range the PC is active but when that particular Bluetooth device is not detected, the program will detect your phone is out of range and automatically lock your system, requiring the password to be entered to reactivate the system. It can also automatically unlock the computer when the device comes within the range. Firstly, Switch on your mobile phone’s Bluetooth. Now, Start Blue Lock and wait for a minute to generate list of discovered Bluetooth devices. Click on a device from the list and its ID and hardware address will be copied to the “Lock Device” field at the bottom of the screen. The program will now loop continuously, and if that device is not detected the system will immediately lock up. The default locking mechanism is a standard Windows API call and is perfectly safe, it’s just the same as if you locked the system with CTRL-ALT-DEL. 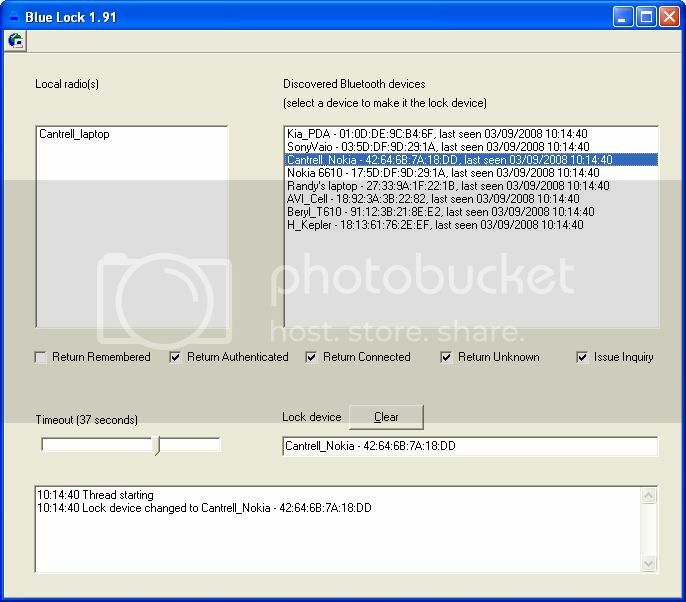 Blue Lock can also be configured to launch an external program when it locks your system. Check out the developer’s website for more information. This program is suitable when you’re working in office. You may have to leave your table often and in such a case you can easily prevent unauthorized access. But I feel there’s one disadvantage, i.e. ; you need to keep your mobile phone’s Bluetooth on! This will drain your phone’s battery quickly. And, OH! Looks like there’s another disadvantage! Nowadays, many Bluetooth devices have long range connectivity and therefore it may still detect your device even if you are the other end of the office.